Perhaps India's biggest concern in playing XI in ODIs is the No.4 position, but still another major area of concern comes in the name of who will don the role of the finisher. With Mahendra Singh Dhoni showing signs that he may not as good as he once was as he enters the twilight of his career, India needs to find a new finisher in his place. Even though they tried quite a few players like Suresh Raina, Kedar Jadhav, Hardik Pandya, Dinesh Karthik, and Manish Pandey, they haven't stuck with one player for a prolonged period of time. With the World Cup less than a year away, India should stick with a player at each position to ensure that they have a settled line-up as they look for their third World Cup title. The fact that Manish Pandey has been given another opportunity after a disappointing outing in 2017 is a sign that they are willing to show some faith as they look to have a settled side ahead of next year's World Cup in England. Here is a look at three reasons why India should stick with Manish Pandey as the finisher. Manish Pandey was the stand out performer in the recently concluded Quadrangular A-team Series, where he led India B to victory and was impressive with the bat as well. He was the leading run scorer of the tournament with 306 runs in 4 matches (1 century and 2 half centuries) with the strike rate of 100.99 and all of that without being dismissed even once. He showed a lot of responsibility throughout the tournament which got him the place in the Asia Cup squad, where he will be eager to continue his good form. 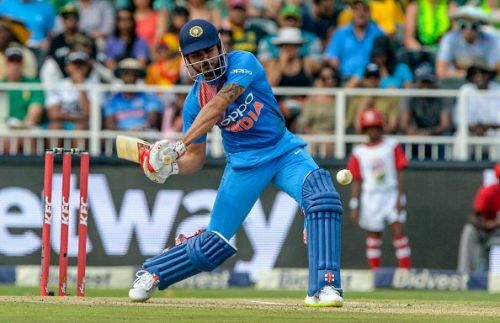 Manish Pandey: India's best option to bat at number 4?